we're "photo of the month" on wedding vendors directory! the talented san diego-based myong hong of prodigy studios is the mastermind behind wedding vendors directory, an up-and-coming wed planning site. it's described as a "user friendly website that provides engaged couples and any viewers a simple way to search for wedding vendors without having to create a membership." we think any way to simplify the already daunting and stressful task of wedding planning process is a great idea! we're thrilled and honored to be chosen as the site's first featured "photo of the month!" 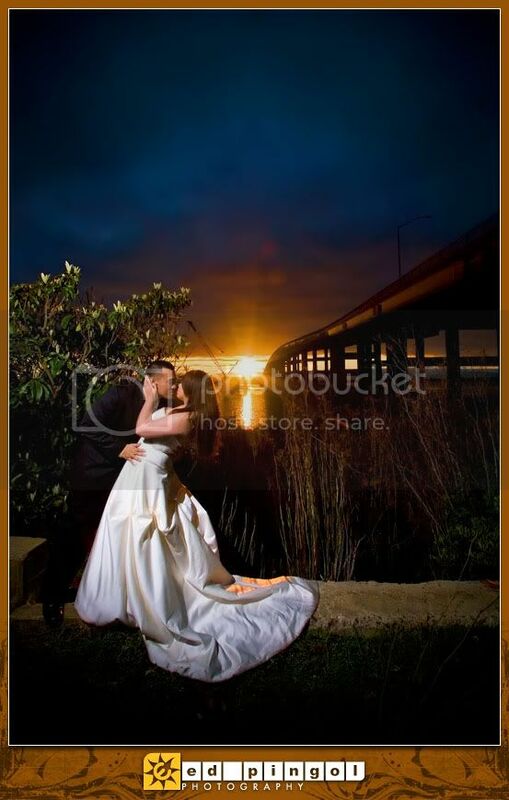 check out the image we submitted from melissa & edler's aftershoot. thanks so much to our lovely bride and groom and to myong for the awesome recognition! We are proud to give our very first photo of the month to Ed of Ed Pingol Photography. "This shot was shot with a canon 30d with a manual setting of 1/180th @ f/11 - iso100. "why f/11?" i picked f/11 because of how the subject was lighted. my lighting set up for this particular shot consisted of 1 SB-28 powered @ 1/1 set at 24mm wide beam spread on a monopod triggered by a pocket wizard held camera left by an assistant. This setting brings the glare down of the sun tremendously while at the same time saturating all the colors of the sunset."